The Ultimate Suite представляет собой комплексный набор инструментов для Excel, которые были накоплены AbleBits за 15-летний опыт создании Microsoft Office. На протяжении многих лет добавляли новые функции, которые появлялись с каждой новой версией Excel и совершенствовали код, чтобы сделать инструменты столь совершенными, какими они могут быть. The Ultimate Suite is a comprehensive set of tools for Excel that accumulated our 15 years of experience with Microsoft Office development. Over the years we’ve been adding new features, bypassing pitfall that emerged with every new Excel version and refining the code to make the tools as perfect as they can possibly be. The Ultimate Suite is an excellent set of tools for everyday use. Each add-in solves one of your usual tasks, whether it is removing duplicates or merging data, and it solves the task impeccably. By combining several tools you can easily build a solution for practically any task just as with a Lego set. Your usual tiring, time-consuming and error-prone routines are not a challenge any longer! You can work with your Ultimate Suite everywhere – on your home computer or terminal server, in campus, small office or corporate network, no problem! Tens of thousands of users all over the world have already made sure of this. 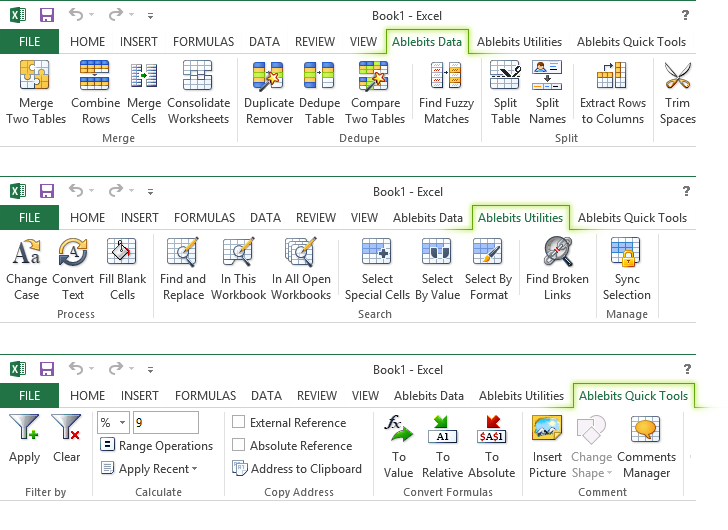 Each version of Microsoft Excel brings new capabilities along with new specificities and issues. We guarantee that your Suite will work faultlessly on any version, from classical Excel 2003 to the most up-to-date Excel 2013 64-bit.